cheers pash: i bought a spare lh switch unit, but it doesnt play up often enough to make me want to disturb anything. XB9SX in Kick Ash built Dec 05, 1st reg by me on 17th Jan 2007 with the usual 12 delivery/test miles. Current mileage 38,039. Oils changed every 2500. Forks Mazzed every 9,500. No serious issues, cracked plastics on translucent tank (replaced under warranty) now cracked again, and replaced with a solid plastic item! Intermittent fault with cooling fan replaced by me just out of warranty. Oil pump gear replaced with 'Lucky Hands' as a precaution at 35,850 miles approx. Runs very sweet by my last outing to Cabinfever 2013! First registered May 2008 to a chap in Luton, during it's 1000 mile service test run at BB the engine blew up (apparently a woodruff key had been left out of a component during assembly). I bought it August 2008 with complete new engine/gearbox. Owned it 7 hours before some dozy bat reversed into it at a petrol station. Replaced damaged parts on the way to holiday in France, engine light during trip was an engine sensor fault I think the lambda but my French and their English was not the best, replaced under warranty. Oil pressure warning light at the beginning of November 2008 resulted in bike being at Lincoln HD until the beginning of March, An unfamiliar tech (it was a new franchise) resulted in the fault being identified early (oil pump casting fault) but faulty replacement parts meant the bike got new swing arm, oil pipes, oil cooler and pressure switch, only by borrowing an oil pump off a 2009 bike was the fault rectified. 1st rear tyre at 6000 mile, near side (not the belt side) bearing notchy, struggled to remove that side the other side was easy, on the front it was the off side bearing, personally I think the problem is dodgy machining of the wheels, whether that was because of lack of QC or possibly the wrong tolerances from Buell. Fitted a pair of Palmer screen brackets. 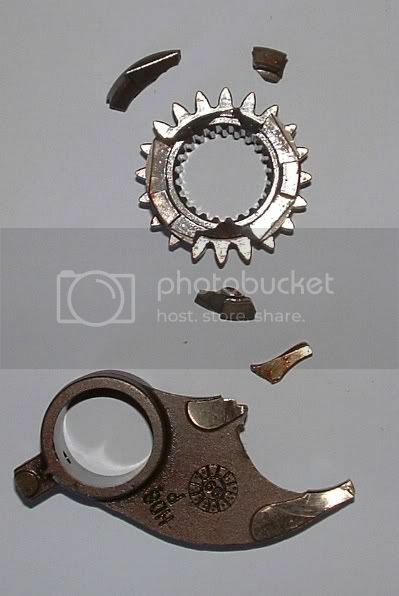 After a number of bearing replacements on the rear, at every 6000 mile, the bearing that was easy to remove eventually started spinning the outer race in the wheel, tried dimpling and gluing but on perceived safety grounds changed the rear wheel, have never had a problem with any bearings since. In July 2013 at 28,000 miles the clutch started playing up, on stripping it apart it was discovered the ramp mechanism seat had given way, repaired by machining the back of the primary chain casting and fitting a plate, on reassembly the hollow bolt part of the clutch cable snapped, replaced cable. while off the road with the clutch fault I have replaced the steering head bearings and the swinging arm bearings which were perfectly ok after 28,000 miles, decided to retire the Buell from touring duties so bought a Guzzi 1200 sport and stripped all the metalwork off the back of the bike, it looks a lot better now, also touched up some of the paintwork mainly the charcoal coloured chassis parts, found a Hyundai colour which is an amazing match. 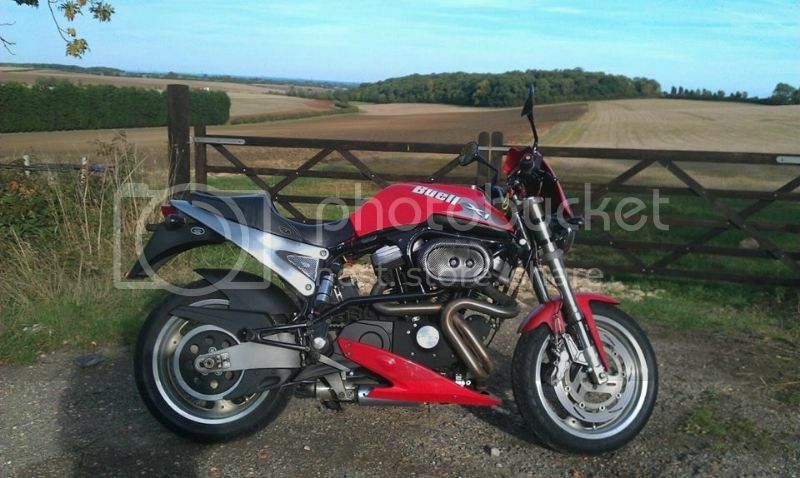 1125r new November 2009 now 12657 miles. Wiring harness fitted at 500 miles relay replaced twice since. New Pirellis and rear wheel bearings at 6000 service. Tail light bulb around 9000 miles. damaged sidestand (my fault) at9500 miles. new battery at 10000 miles. Next up winter job 12000 service. An update on the Uly report - sheared front isloator mount replaced at 15k service so 5000 almost trouble free miles. Was also lucky enought to bump into Chris & Jane Jessop at the emporium yesterday. Good people all round (you too Maz), thanks so much for the effort and time you've devoted to the cause. Without a doubt the work put in by all 3 of you is the only reason I've been able to maintain my connection with Buells since 2009. Jeez - just spotted all the spelling mistakes (hopefully corrected now), still shitfaced from last night. 2001 X1 Tube Purple/blue frame. Bought off Ebay with 26000 miles. dreadful condition stored outdoors serviced by a clump with a hammer and lack of care. now passed 30,000 miles at last its running sweet. On collection from previous owner; plastic fuel filter split during journey home, oil hose leaks at most joints, broken plug lead, TPS needed setting, exhaust not hung properly joints all blowing, seat catch bent so seat falling off, fuel gauge not working, resprayed with paint that is soluble in petrol . Fuel filter in the tank fell off and pump got blocked, took that apart and fixed it. Its also had a New drive belt as the old one snapped during a missfire. All connectors on the bike have now been wriggled and wd40'ed, the V&H pipe has been repacked. I have now polished the swing arm and seat frame, fitted new swing arm bearings and headstock bearings. Resprayed the plastics metallic orange, fitted a new leather seat cover, the seat clips into place nicely. The whole bike just keeps getting better. on the whole all the faults with my bike are down to cack handed spannering and lack of maintenance. Bought from Big Rock Harley in Notts in 2002 with 2300 miles on the clock. Consumables as per. Plus 4 batteries (5th in post as we speak) And now on Third drive belt. Minor setbacks caused by silly sidestand and clutch cutout switches. Not changed drastically. Full US Gearing and speedo. Buell race filter. Buell factory custom seat. Millennium screens. And a Wyleco can (after the Supertrapp dissolved) Subframe hand polished by me. Ive come close to selling on a few occasions. But after 12 years of ownership, Im afraid the old girl is staying for the duration. Thing is, I still get a buzz every time I open the garage. My heart still beats faster every Spring when I start her for the first time. Update on my '06 XB9SX report; the original pre-Goodyear belt finally let go at 38,170 miles! Not bad! Shame the spare HD supplied me with was a Uly one. Thanks pash for the swap. You forget how stiff the new ones are at the fitting, and realise how shagged the old one was! Yup got 6000 miles out first rear and just got another set on order.Guess you get your knee down more than I do.Even so unless you do track days 3000 miles seems fairly low.What are other 1125 owners getting. My CR was only getting between 2500 and 3000 out of the Pirellis ...... swapped to BT023's for my European tour in 2010 as the two week trip was over 3000 miles and now getting in excess of 7000 . Partial rebuild to make roadworthy. Full rebuild early 2012 with American gearing bringing the mileage down to 13k. 3500 mile rip to Menorca and back summer 2012 without missing a beat. All 5 & 10k services done by Maz with all recommend changes. 4200 mile trip round Europe this year with a starter issue in Austria fixed by Euro Buell member Tom BUpunkt. Latest Pilot road 3's put on before the Europe trip done 4500 miles and don't look scrubbed in yet. Before and after pics below. A couple of extra bits since the rebuild, ally dash, Pipewerx Buell race rep and Spondon headstock.